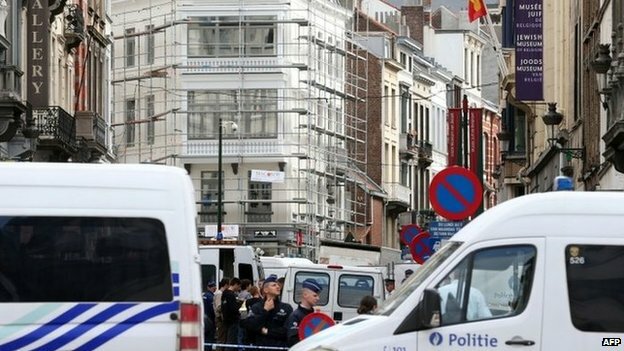 A gunman has shot dead three people at the Jewish Museum in the Belgian capital Brussels, and fled the scene, officials say. Belgian broadcaster RTBF said the shooting had taken place inside as well as outside the museum. Deputy Prime Minister Didier Reynders, who was one of the first people to arrive at the scene, said he was shocked by the attack. The gunman arrived at the museum at around 15:50 (13:50 GMT) carrying a backpack, then opened fire before fleeing in a car, Belgian media reported. Prime Minister Elio Di Rupo expressed his condolences and support for the victims' families.